When it comes to weddings, there may come a time where you have absolutely no clue where to start. With our handy wedding essentials list, you can be on your way to having a successful wedding! From elegant to modern, our list of wedding must-haves is filled with a variety of handmade wedding goods from indie sellers. Since it’s a once-in-a-lifetime event, your wedding is meant to be filled with extravagance, no matter if you have a shabby chic wedding or a high-end ceremony. Find the wedding basics you need here with our guide or get ideas on how to begin your wedding planning journey! Invite your guests in style with one of these uniquely handmade wedding invitations! Give your guests a winning lottery card with your special day’s date with Fresh Paper Studios’ scratch-off lottery card invitation! This wedding invitation is personalized with the groom and bride’s names and with the wedding date, which the guests must scratch off the grey circles to reveal the date. 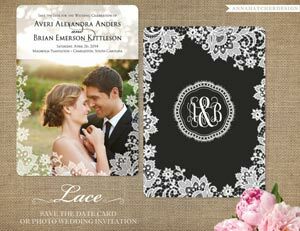 This listing provides a sample of what your wedding invitation would look like and, if you are satisfied with the invitation and purchase a whole set, then you receive $10 off on the final invitation order. Directions to purchase this wedding invitation sample is in this listing, and you receive customizable options, such as colors, for these invitations to make it match your wedding theme. 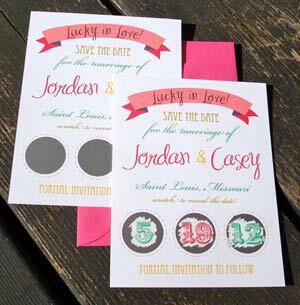 Fun and different, this lottery card wedding invitation is sure to be a huge hit with your guests! 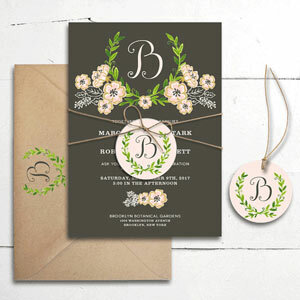 Elegant with floral, whimsical design, Smitten On Paper’s Budding Romance invitation! This lovely invitation presents a personalized initial and flowers and leaves surrounding it along with wedding information for your guests. A matching brown envelope comes with this invitation sample along with an RSVP card and hang tag. You can customize this invitation with any color and font to make the invitation completely your own. You also get free proofs, color changes, extra envelopes and more with your final invitation order. Send out beautiful photo invitations to your wedding guests with Anna Hatcher Design’s save the date wedding invitations! These invitations can be made with a special, professionally made of the groom and bride and used as a personalized and more intimate invitation for wedding guests. The wedding information appears on the photo side of the card, and the photo is framed in lace flowers. The back has the monogram of the groom and bride’s initials and also has a lace overlay design along the border. You can personalize this invitation further by choosing colors and/or fonts you want to appear on the invitation. Having a wedding requires a theme, and that’s where decorations come in! With decorations, you can bring out the vision you had for your dream wedding. Charm your wedding venue with a fairy tale banner from A Banner Affair! 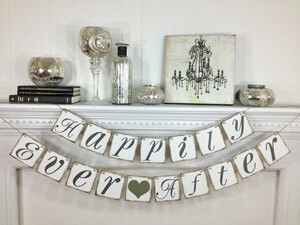 This Happily Ever After banner is made with sturdy chipboard and cardstock-made letters. With antique-looking edges, this whimsical and timeless wedding banner adds more romance in the air at your wedding. Add this banner to the wedded couple’s table at the reception or on a fireplace for an extra touch of enchantment. You can also customize the colors of this banner at A Banner Affair’s shop! More extravagant than the red carpet, a personalized aisle runner is just the right finishing touch you need for your ceremony! This aisle runner from Starry Night Design is made from a topnotch cotton fabric that won’t tear and comes in a 45-inch or 60-inch wide,20-feet long size. You can personalize this aisle runner with the bride and groom’s first names, last name initial and the date of the wedding. 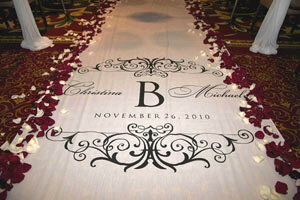 A whimsical, elegant design wraps around the customized words, which fits a sophisticated wedding perfectly. Brighten up your wedding in a magical way with Fairy Lighting’s pink flower lights! Featuring 20 pink flower lights at 11.5 feet long, this stream of whimsical lights makes a great addition to your wedding decor. If you’re having a woodland or fairy theme, these pink flower lights will fit wonderfully in your wedding. 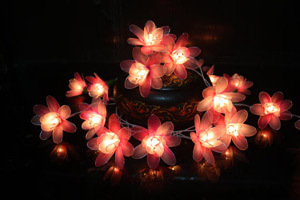 Find more flower lights in various colors and designs in Fairy Lighting’s shop! Show your appreciation to your wedding guests by providing them with favors to take home after the wedding party! 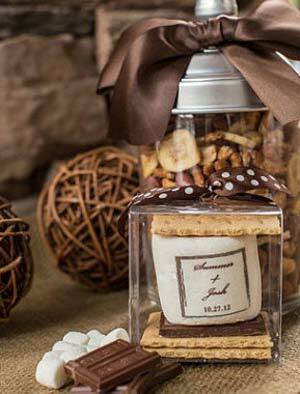 Although s’mores may be a casual, campfire treat, Fete Setter has created classy s’mores favor boxes that are befitting for an elegant wedding! With two graham crackers sandwiching a jumbo marshmallow and a small block of chocolate, these s’mores wedding favor boxes are a delicious treat for your guests to take home. You also get to customize the jumbo marshmallow with the groom and bride’s name along with the wedding date to make these favors more personal to your wedding. This listing includes 150 wedding favors and you can also purchase multiple sets for your wedding. Send your guests home with Lulu Sugar’s candle favors! These candle favors come with a chalkboard-styled design on the lids that display the bride and groom’s names and wedding date. 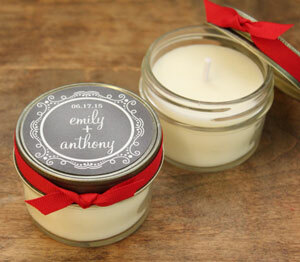 The chic design on the lid gives these candle favors a rustic yet elegant appearance. You get to choose one scent for this set of 12 candle wedding favors, which can be Citrus Basil or Cucumber Melon. You can purchase multiple sets and have fun choosing different scents for each to mix and match them in your wedding. These candle wedding favors also provide a long-lasting, reusable jar that your wedding guests can use for household purposes. 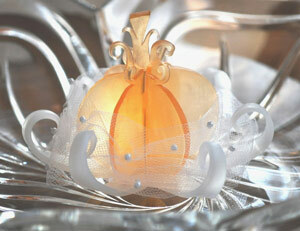 Share your Cinderella moment with your wedding guests with DG Attic’s pumpkin, carriage-like soap! This lovely soap is made into an elegant, orange pumpkin that is wrapped in beaded tulle, making it into a princess-like, fairy tale design. The soap is infused with a honey almond fragrance and is placed in a transparent boutonniere favor box. You also receive bulk discounts depending on how many pumpkin soaps you purchase from DG Attic. Wedding days are special events not only for the bride and groom, but also for the wedding guests. Let your guests share this special day with you and leave something behind for you to commemorate your wedding by having a guest book readily available for signing. Having a rustic or country themed wedding? Lorgie’s wooden wedding guest book will be a great addition to your wedding then! Made from pine and Tasmanian oak, this guest book is also engraved with the bride and groom’s name along with the wedding date. 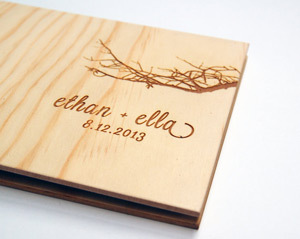 A special tree branch from a Boab tree, known to grow in the wilderness of northern Australia, is engraved on this wedding guest book as well. The binding of this guest book allows you to easily remove or add more sheets and provides flexibility to open the book widely and stay that way. Add a little elegant uncommonness to your wedding with Mooseberry Print Shop’s tree wedding guest book! With 175 leaves for guests to sign, this tree will soon bear fruits of timeless, wedding memories for you. Personalize this 36×24-inch guest book with the groom and bride’s names and the wedding date! 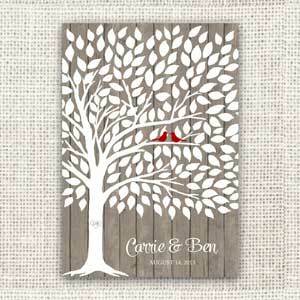 Two love birds are perched on the tree, which adds that romantic touch to this wedding guest book. 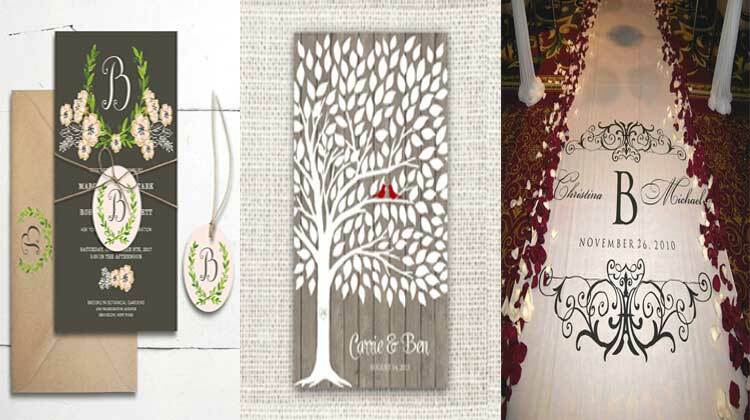 Find more tree wedding guest books in Mooseberry Print Shop to accommodate your wedding theme. Even though these items are popular wedding basics, they’re also incredibly unique in their own way. The beauty of going back to the basics is that you can decorate them in any way you want in order to find your own special theme for your special day. Whether you go rustic or modern, there are invitations, decorations, wedding favors and guest books to accommodate your wedding theme. Happy planning and congratulations to those who are getting married!